Annunciation Cathedral in Koyoto, Japan is the seat of the Diocese of Western Japan of the Church of Japan. Annunciation Cathedral developed from the efforts of early missionaries sent by Bishop Nicholas (Kasatkin), the Apostle to Japan, during the latter decades of the nineteenth century. The initial missionary in the Kyoto district was Pavel Nakakouji, a catechist who visited the city in 1880. By 1889, a meeting hall was acquired in the central district of the city and a full time catechist, Kiril Sasaba (Masakichi), was assigned to the mission under the supervision of Father John Ono (Shogoro), the priest in the neighboring city of Osaka. In 1890, a missionary hieromonk from Russia, Sergius (Stragorodsky), later patriarch of Russia, was assigned to the church in Kyoto where he developed the pastoral life of the Kyoto parish during the next three years. Subsequent to his return to Russia, Fr. Sergius wrote a book of his experiences in Japan entitled "Hokkaido Travel Notes". In 1894, Fr. Simeon Mii (Michiro) was assigned to the Kyoto community. During Fr. Simeon's tenure the site of the old Kyoto Noh theater in Yanagi-no-Banba, Doori-Nijo Agaru was purchased in 1897 upon which the present Annunciation church was built. The church, designed by the architect Matsumuro Shigemitsu, was completed in December 1901. Bishop Nicholas of Tokyo consecrated the new house of prayer in May 1903. Commemorating the consecration of the church, the parish received a Gospel Book bearing the signature of St. John of Kronstadt. Additionally, as an annex to the church, the Kyoto Orthodox Women's School was founded with the completion of the church. The school was supervised by Nadezhda Takahashi (Ine). In 1906, Bp. NIcholas was assigned Bp. Andronik (Nikolsky) as an assistant bishop. Bp. Andronik, who carried the title of Bishop of Kyoto, was only able to stay three months due to poor health. Subsequently, as Archbishop of Perm, Bp. Andronik was martyred by the Bolsheviks in 1918 and glorified as one of the new martyrs of the Church of Russia in 2000. During the Russo-Japanese war in 1904/1905, the Kyoto parish under Fr. Simeon was tasked, in addition to his parish duties, to administer to the Russian prisoners of war in the prisoner camps near Kyoto. In 1908, Bishop Sergius (Tikhomirov) was assigned as Bishop of Kyoto to assist Abp. Nicholas. Bp. Sergius subsequently succeeded Abp. Nicholas after his repose in 1912. After Bp. Sergius succeeded to the Tokyo see, the see in Kyoto remained empty until 1962. In 1932, as Fr. Vissarion Takahashi (Choshichi) succeeded Fr. Andrei Metoki (Kingo) as the presiding priest of Annunciation Cathedral, a change began in the political character of the government of Japan that would have ramifications on the Church of Japan, in addition to that upon country of Japan. 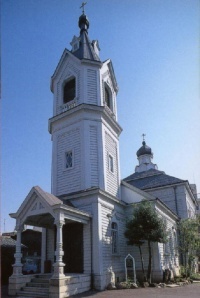 While World War II resulted in the destruction of many parish churches throughout Japan from the air attacks on the cities of Japan, Annunciation Cathedral survived as Kyoto was not bombed under American policy. Also, because of the timing of the end of the war, the cathedral escaped destruction from the planned building of firebreaks through the area. In 1986, Annunciation Cathedral was designated by the Kyoto Metropolitan Administration as a "tangible cultural property". As the cathedral approached one hundred years old since its construction, 1987 witnessed the start of a program of renovation and restoration as the church was re-roofed with copper sheets. During 1999, a general renovation was begun that has included repairs to the flooring, re-carpeting, and re-painting the interior and exterior walls. Located in the University District of Kyoto, Annunciation cathedral attracts many researchers and students from the Orthodox countries who attend school in Kyoto. This page was last edited on October 22, 2012, at 20:38.